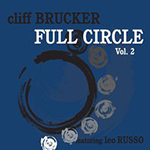 If anyone wondered if Cliff Brucker’s dynamic Full Circle sextet’s follow-up CD could match the prowess and excitement of their 2016 debut recording, they can rest assured that “Vol 2”, if anything, actually exceeds it. This is NOT surprising, given the caliber of these 7 excellent veteran players (including Pete Levin’s fine comping & solos on tracks 5, 10 &11); in addition to the advantage they’ve had of almost two additional years of playing together. Once again, they utilize the same tried & true inspiration and song sources: superior Great American Songbook standards and post-bop/mainstream gems, primarily from the 1960’s & 70’s by some of that era’s finest players and composers. The only exception is a swinging current original, “Full Circle”, written by Dylan Canterbury, that appropriately ends the CD, as well as serving now as their theme song. They hit the ground running with a tight, hard-driving version of Jerome Kern’s 1932 standard “The Song is You”, arranged by Dylan Canterbury. This standard has been recorded by innumerable instrumentalists and vocalists, but most popularized by Frank Sinatra. The tempo and immediacy then stays “UP”, with their tight version of Sonny Rollins’ classic “Airegin” (Nigeria spelled backward), first recorded in 1954 by the Miles Davis sextet featuring Rollins. “Laura”, a popular delight since it was adapted from the 1944 film of that name, is taken at a smooth, medium tempo. It’s kicked off by Leo Russo’s warm delivery of the unforgettable melody, followed by Larry Ham’s enchanting solo and likewise, those of Mike Novakowski and Dylan Canterbury. This band has so many consistently strong soloists (from both a melody and Jazz standpoint), in addition to the consistently pulsating groove laid down by Cliff Brucker & Otto Gardner. So, I personally don’t feel any drop-off in the course of a song - just each soloist’s unique way of telling their part of the story. All of those features, plus their tightly-blended ensemble work and supportively accented piano comping makes for a truly appealing musical package. I would put “Deception” (from the very influential Miles Davis’ “Birth of the Cool” album”), “Crazyology” (recorded by Charlie Parker & Hank Mobley) and also “Nostalgia” (composed by Teddy “Fats” Navarro) all in the same category: lesser known songs, with dynamic, use of TEMPO to create very captivating performances, such as done here. As much as I’ve thoroughly enjoyed the swinging excitement of all these preceding medium and fast tunes, I have to confess to having a special place in my heart (mind & soul) for the touching beauty of their versions of both Johnny Mandel’s gorgeous “Emily” and Clare Fischer’s exotically alluring “Pensitiva”. Major props are once again due to Cliff Brucker for his research, planning, song selection and leadership. And hats off to each band member’s rich individual contributions in showing that post-bop/mainstream Jazz, in addition to being hard-swinging and exciting, can also be fresh and beautifully accessible. Tom Pierce has had a burning passion for Jazz for over 50 years, initiated and fueled by seeing live in New York City, starting in the early 1960's, virtually every major artist still performing. He's been very happily living in Guilderland since 2001, as an active retiree sharing his love of music by writing online reviews for a number of web sites, preparing DVD presentations to various groups, co-Hosting Radio programs showcasing his favorite artists and busily supporting A Place for Jazz in a variety of ways.